Two identical double houses built in 1671 by Adriaan Dortsman for Jeremias van Raey. Van Raey went to live in the one on the left and he let the one on the right, a.o. to the painter Ferdinand Bol. 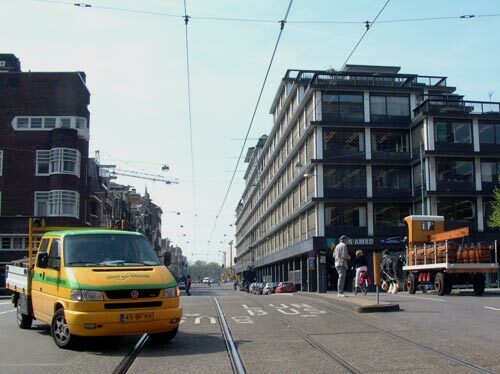 The layered (fluted) sandstone facades are characteristic for the “flat style” of Adriaan Dortsman, a classicist style used in Amsterdam between 1665 and 1700. The doorsteps, however, are 18th-century. On the balustrade are the statues of Mars (war) and Vulcanus (fire) on the left, on the right Ceres (agriculture) and Minerva (wisdom). The house on the left is the Van Loon House. It has a interior in Louis XV style (1752) and a garden house with a coach house behind it (in the Kerkstraat). You may view the interior; the building now houses the Museum Van Loon, a small private museum. In The Bazel at Vijzelstraat 32, a monumental building called after the architect K.P.C. 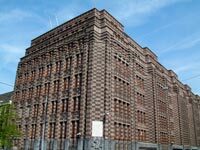 de Bazel, has its residence the Buro Monuments & Archeology and City Archives. 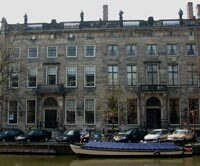 De Van Raey-Huizen (1671), Keizersgracht 672-674, are 17th century examples of sculptured cornices. You see Ceres and Minerva, the goddesses of Fertility and Wisdom, at Keizersgracht 672 as well as Mars and Vulcan, the gods of War and Metal working, at 674.